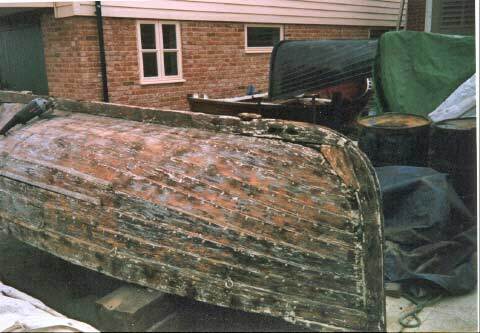 In March 1996 PORTWEY’s lifeboat, which had been sitting in its chocks for 69 years, was deemed to be unsafe, and was therefore taken ashore to be stored in a Warehouse belonging to the Maritime Trust. Very fortunately, a replacement boat of similar size, except that it had a transom stern and was not double ended as with the original, was located by one of the Volunteer crew. The owner was willing to donate it to PORTWEY which was a most providential. It had been expected that a suitably sized replacement would be very difficult to find and might well have been prohibitively expensive. The boat has remained on board since 1996, and few visitors realised it was not supposed to be there. However, the boat, which had just been restored when it arrived on board, was beginning to show signs in 2002 of decay. The environment in which wooden boats are stored on a vessel is by no means ideal. Firstly they are out of the water and thus the pressures exerted on the timbers is not to that for which they are designed, i.e. water pressing on the hull from outside. Secondly they are subject to a large range of temperatures, and thirdly they tend to get little maintenance and seldom get into the water. It is a testament to the builders of PORTWEY’s lifeboat that it lasted so long. At the beginning of 2002 the 75th anniversary of the launch of PORTWEY in August was approaching and the Trustees considered what could be done to celebrate the event. 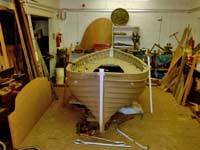 Amongst other ideas, the thought of having the original lifeboat restored received considerable attention. There were two possibilities; one, to have the boat ‘cosmetically’ restored so that it would look the part on board but not be thoroughly serviceable for rescue activities, and second, to have the boat restored to original condition. It was agreed by all that this second option should be pursued. The boat had been lying upside down, covered over, out in the open ever since its removal from PORTWEY, but, surprisingly, little further deterioration seemed to have taken place. The hull was inspected and sharp intakes of breath were heard. Estimates were received from three Shipwrights and then came the rub. The estimate accepted was for around £10,000 and somehow this had to be raised. It was known that the Heritage Lottery Fund has a ‘fast track’ system for grants of up to £50,000 and it was decided to make a bid. Having previously obtained eight times more than this from the Fund was a considerable help to knowing the procedure. However, it was not known whether the Lifeboat would qualify. Very quickly it seemed, agreement was given, and the contract awarded in May, 2002. The Lifeboat was taken to the Yard of David Patient at Maldon and work began. The timber had to be stripped of all paint and much decayed wood removed. It was explained to David that there was no urgency for the work to be completed as, in fact, PORTWEY always carries liferafts for lifesaving purposes in any event, but the Lifeboat will add extra lifesaving capacity and will also act as a tender when PORTWEY is moored offshore, which will be a great asset. 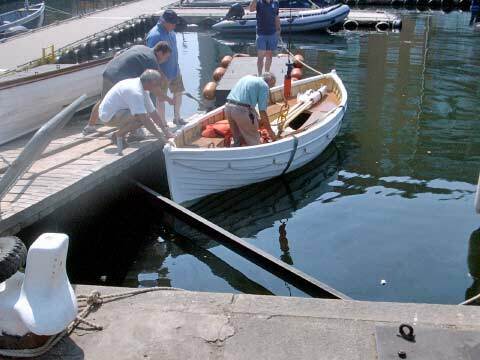 The boat was ready to be returned this summer, complete with a full kit of equipment, including a mast, sail, oars, rowlocks, tiller and cover all of which had disappeared over the years. The rudder still remained and this was tidied up and painted. The boat, now looking ‘as new’, was brought back to PORTWEY in August. The workmanship was first class and the Trustees are indebted to David Patient for his craftsmanship and dedication to a 76 year old piece of British Heritage.